Abbey Veterinary Group have practices both in Chaddesden and Chellaston. They are a well established vets that have been in Derby for over 30 years. They asked us to work with them to re-brand their company, build them a new desktop website, a mobile website and an iPhone and Android App. They wanted to move away from their current colours of claret and blue and although they did not want the change to be too drastic they did want a modern, professional and fresh look to their branding. The new branding, websites and apps were completed by Webtouch Ltd within just 8 weeks and Abbey Vets were extremely pleased with the finished results. The new branding has now been rolled out to all of their online and offline marketing. They can via the iPhone & Android apps feature of sending geo-fencing push notifications offer their monthly special offers directly to their customers mobile phones screen. This has given their veterinary practice the edge over their competitors. They also make great use of the ‘Loyalty’ features in the apps. Customer retention is an area that many businesses do not always address and nurture, but is an area that can be hugely profitable. 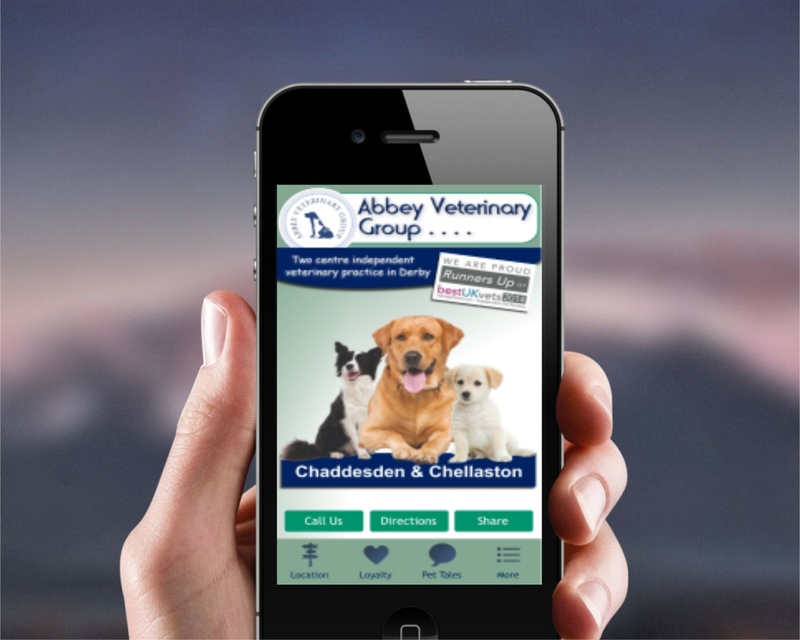 Abbey Vets is a very busy practice, so they requested that Webtouch Ltd maintain the new website and their iPhone and Android native apps. For a small monthly fee this service is available to all our customers should this be a requirement. Abbey Vets with our SEO services that were built into the website from day one are at the top of Google for searches ‘Vets in Derby’ or similar phrases, which is a fantastic place to be! !